Located in Fujian, Pingtan Island is the fifth Iargest island in China. It is only 68 km from Hsinchu in Taiwan. This island was added to the list of UNESCO World Heritage Sites in 2001. The main attractions on Pingtan Island are Longfengtou Beach, Xianrenjing and Shipaiyang. At an altitude of 104 meters, the mountain covers an area of 1.1 square kilometers. The cliffy and steep mountain rises along the coastal line, with huge rocks overlapping. It is particularly famous for its unique landscape, cape bay and temples. The main scenic spots include Tongtian Platform, Leishi Hole, One Line Sky, and Wife Rock. Nanzhai Mountain is located in Beicuo Town, south of Pingtan Island in Fujian province. Large granites decorate the low hills. Many of them are of unique shapes, including more than 40 pictographic rock scenic spots. Typical landscapes include Camel Rock, Mandarina Duck Handling Feathers, Leopard Hunting in Mountain and Turtle Rock, making the mountain a rock zoo. With a 4.5-kilometre-long coastline and a width of 500 metres, Longfengtou is the largest natural bathing beach in China. The pristine white sand beach is flanked by a thick coast oak forest on one side, and water clear enough to see your feet in on the other. The flat slope makes it an ideal place for a variety of beach sports. The Cross-Straits Sand Sculpture Festival and Kiteboard Tour Asia is held here every summer and it's a big draw for tourists. A walking tour in the Xianrenjing scenic area with natural landscapes shaped by a past volcanic eruption, as well as marine abrasion and marine deposition. One of the amazing landscapes is a 43-metre deep and 50-metre wide marine-abrasion cave where you can see huge waves gushing into the cave. 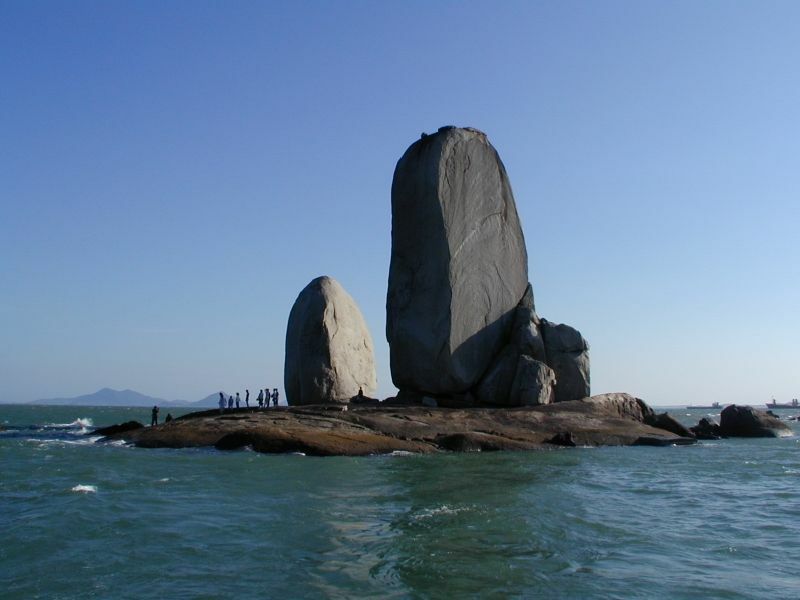 To the northwest of Pingtan Island and along the more than 500-meter sea surface in the west of Aocun Village stands a disc-shaped reef which holds two tablet-shaped rocks. The combination of these rocks is like a big ship with two sails riding on the crest of waves. This is the most famous natural scenic spot in Pingtan -- Shipaiyang, also known as the "Double-Sail Rock". At the bank of Shipaiyang, there’re more than 60 odd-shaped rocks, many of which resemble either animals or bridges or Buddha. 2) 8:30 -12:00 A 3 and a half-hour drive to Pingtan. 3) 12:00-13:00 Lunch at local restaurant. 5) 13:00-15:00 Visit General Mountain for the amazing bay view and temples. 4) 15:00-16:30 Take a half-hour drive to Nanzhai Moutain. Visit the “rock zoo” in Nanzhai Moutain. 5) 16:30-17:00 Take a half-hour drive to Longfengtou Beach. Check in hotel. 6) 17:00-19:00 2-hour free time to enjoy the beach and various water sports. 7) 19:00 Dinner at local restaurant. 2) 11:00-12:00 1 hour drive to Shipaiyang scenic area.